How do political ideologies and urban landscapes intersect in the context of globalization? 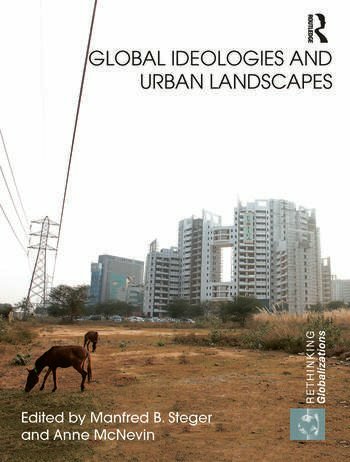 This volume illuminates the production of ideologies as both discursive and spatial phenomena in distinct contributions that ground their analysis in cities of the Global North and South. From Sydney to Singapore, Hong Kong to Hanoi, Las Vegas to Macau, conventional public spaces are in decline as sites of ideological dissent. Instead, we are witnessing the colonisation of urban space by market globalism (today’s dominant global ideology) and securitised surveillance regimes. Against this backdrop, how should we interpret the proliferation of metaphors that claim to communicate the essence of global transformation? In what ways do space and language work together to normalise the truth claims of powerful ideological players? What kinds of social forces mobilise to contest the cooptation of language and space and to pose alternative local and global futures? This volume poses these questions against the collapse of old geographical scales and cartographic techniques for identifying the contours of civil society. The city acts as an entry point to a new spatial analytics of contemporary ideological forces. Manfred B. Steger is Professor of Global Studies and Research Leader of the Globalization and Culture Program of the Global Cities Research Institute at the Royal Melbourne Institute of Technology. He is also a Professor of Political Science at the University of Hawai’i-Manoa. He has served as an academic consultant on globalization for the US State Department and as an advisor to the PBS TV series, "Heaven on Earth: The Rise and Fall of Socialism." Anne McNevin is Lecturer in Politics and International Relations in the School of Political and Social Inquiry, Monash University, Melbourne. She has broad research interests in the contemporary transformation of sovereignty, citizenship and political community with a particular focus on displacement, mobility, borders, humanitarian governance and the global governance of migration. Anne is author of Contesting Citizenship: Irregular Migrants and New Frontiers of the Political (Columbia University Press, 2011) and associate editor of the journal Citizenship Studies.